Easy sleight of hand magic tricks. Do they exist? 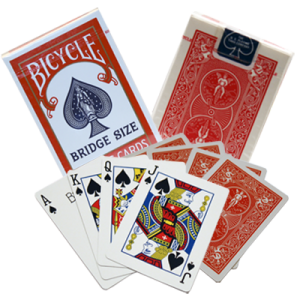 Just the mere mention of sleight of hand is enough to turn many would be magicians away from a particular magic trick that advertises you need sleight of hand skills. 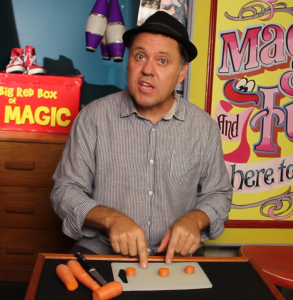 This jumping carrot magic trick in today’s magic lesson is going show you that sleight of hand need not be hard or off putting. You will need to do practice for sure. It has been my experience that anything in life worth while takes some effort on your part. A great place to start is a magic principle called two in the hand; one in the pocket. There are literally thousands of magic tricks based on this principle. It’s easy to do, you can use it with so many everyday objects which makes for my favourite impromptu magic tricks that we talk about so much here at Magic Tricks For Kids. You can use rolled up bits of paper, squashed up bank notes, caps from pens, dice, nuts and the list goes on. I reckon cavemen were doing with stones a long time ago. It was popularized by a magician named Lewis Ganson in the 1970’s. He published “Two in the Hand and one in the Pocket“. So there really many objects you can use. Keep this in mind though: hard or metallic objects will make a noise when you pass them from one hand to another. You might have to limit their use to noisy locations like a party or get together. There is only one sleight of hand move you have to learn. It is called the Shuttle Pass. It is a fancy name for pressing with your thumb to stop something falling out of your hand. Watch the video and you will see. This is also a great little strolling magic routine at events. Often I look out for bowls of individually wrapped mints on display. I take a handful and I’m ready to perform. And you don’t need a table. Ask the people you are performing for to use their hands laid flat as your table. Including people like this in your magic makes for a more memorable experience on the audiences part. Take note too how I encourage the audience to engage in tricks similar to the jumping carrot magic trick by what amounts to coaching them with the question, “What do you do if you get confused?” …. and the audience reply, “Start again!” This creates a rhythm for the jumping carrots magic trick that makes it easier to perform the sleight of hand magic moves. If you want to create a short food themed magic show then go to the Magic Lessons #12 – The Orange Food Magic Trick which would be a perfect opener for this jumping carrot sleight of hand magic trick. 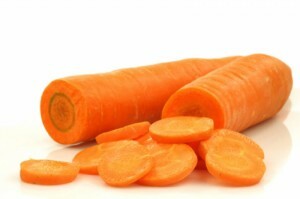 Did you enjoy this Jumping Carrot Magic Trick? To learn more easy magic tricks Click here!